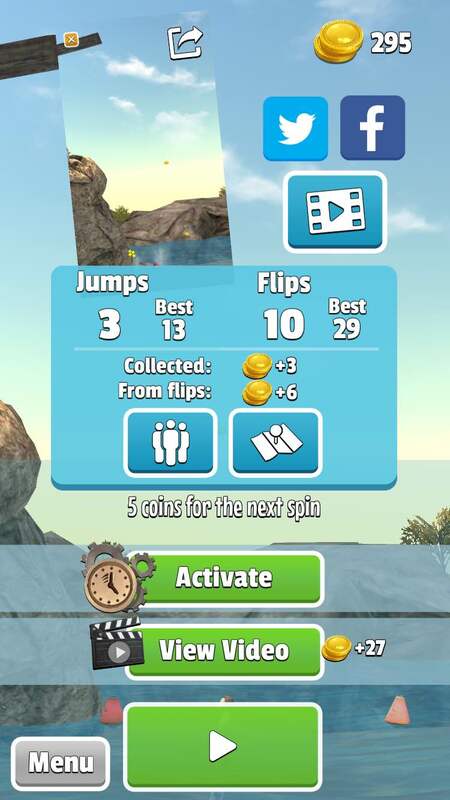 Flip Diving is a ragdoll physics simulation game developed by Finnish MobileVolt Games and published by Miniclip. The game was released globally on iOS and Android on Wednesday, August 17th and was promoted heavily by both platforms, peaking at the #1 Top Downloaded position on Tuesday, August 23rd (US / iOS / iPhone) and remaining there through August 30th. 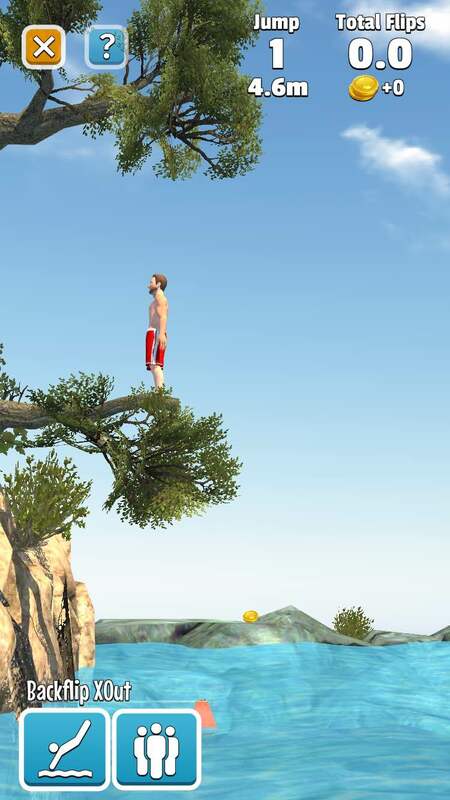 The gameplay of Flip Diving is fairly simple and straightforward: the player directs an avatar to dive off of various tall objects, controlling the avatar’s jump angle as well as its positioning as it falls through the air toward some body of water. 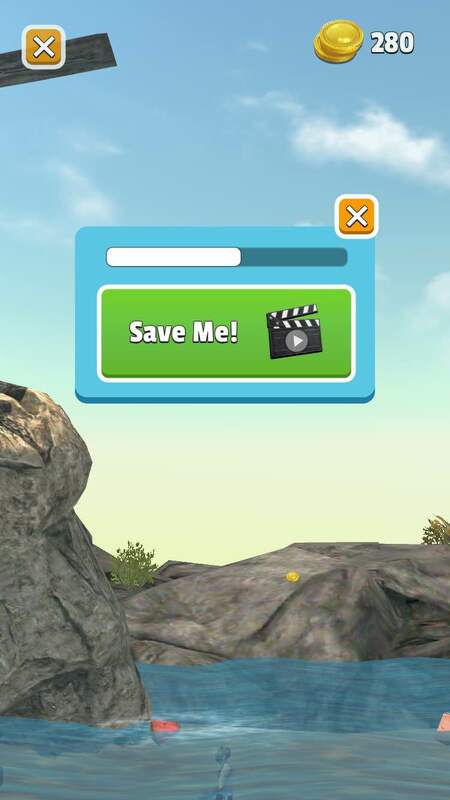 The game features a map loaded with locations at which the player can dive off of ledges: examples are cliffs, the basket of a hot air balloon, a millionaire’s pool, a giant tree, etc. At each location, the player starts a play round on a ledge fairly close to the body of water; upon successfully diving into the water, the player is placed on a higher ledge. After four successful jumps (from increasingly higher ledges), the round restarts and the player is put back onto the low ledge but with a much smaller area into which to dive. The play round continues until the player misses the dive area or lands the avatar on its back or stomach; if either of those things happens, the play round ends. At the end of a play round, the player is presented with some coins as a reward, the amount of which is based on the number of dives the player successfully made as well as the “quality” of those dives (the angle at which the player landed in the water). 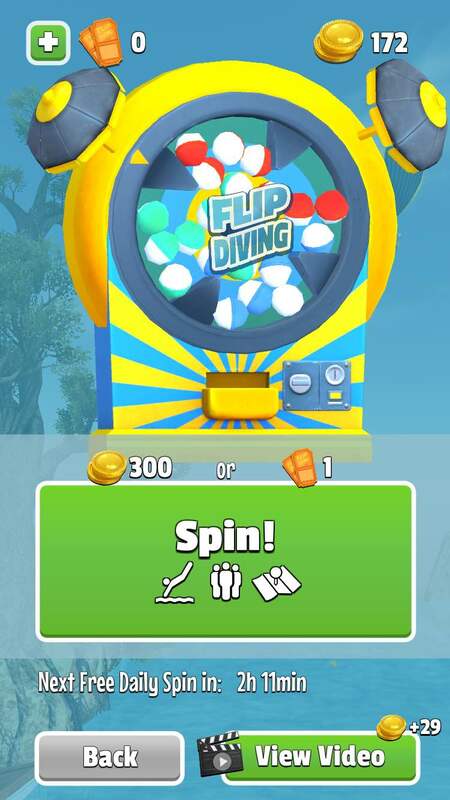 While diving locations can be unlocked via direct purchases, all other content in Flip Diving can only be won in its “spin machine”: a gacha mechanic that the player can “spin” for a chance at winning a random ball containing either game content or coins. 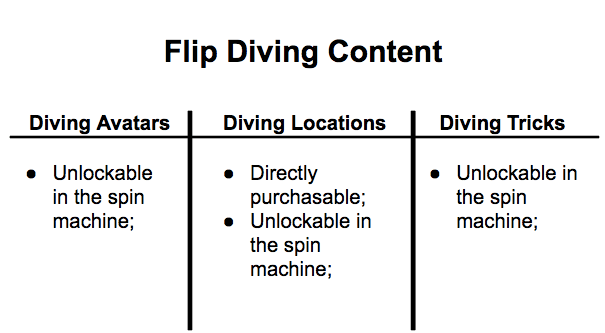 Game content in Flip Diving comes in three forms: new diving avatars, new diving locations, and new diving tricks (eg. backflip, layout backflip, bomb, etc.). 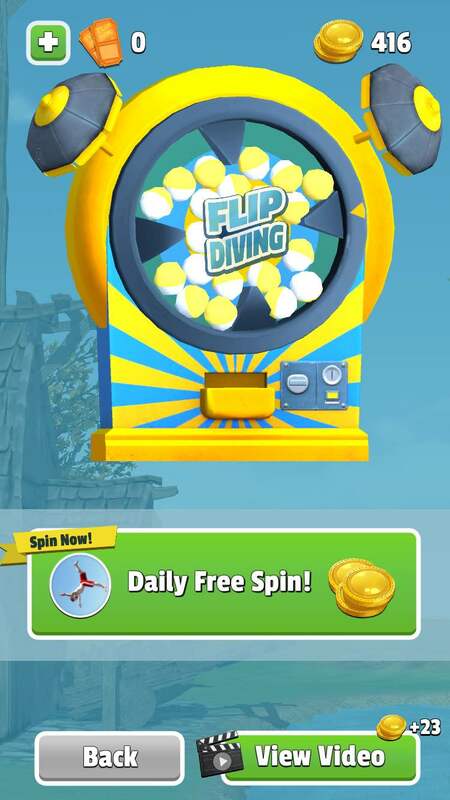 Thus the spin machine is the foundation of the game’s economy: all content except for diving locations is only capable of being unlocked in the spin machine, and the player gets one free spin of the spin machine each day. 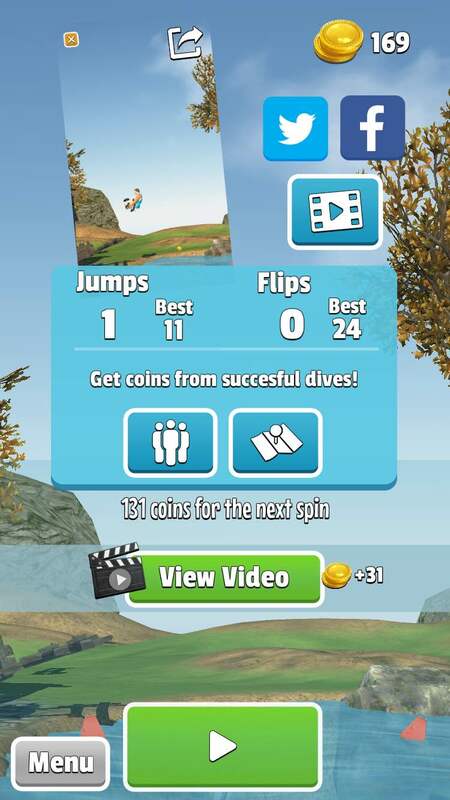 Flip Diving features two soft currencies: coins, which are earned via diving, and tickets, which can be purchased as in-app purchases in packs. Outside of the free daily spin, using the spin machine costs either some number of tickets or some number of coins. An icon linking to the spin machine mechanic is visible in almost every single screen of the game’s UI except for the diving gameplay. This is because the spin machine plays a critical role in the player’s progression through the game: without using the spin machine, the player can’t unlock new content (except for locations, which, again, are directly purchasable). 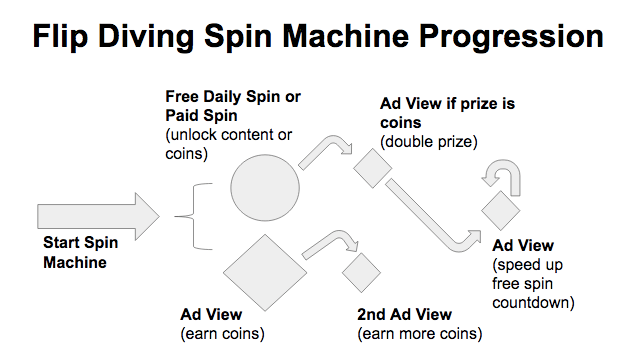 At first blush, this progression loop looks uncomplicated, but this veneer of simplicity masks a fairly complex subset of ad monetization loops that amplify the amount of in-game currency that a player can earn in any one gameplay session, delivered entirely through rewarded video ads. It’s not always possible for a player to watch a video from the spin machine page; that option appears to be throttled on a timer. But the icon does become available immediately after a player pays for a spin of the wheel with coins or a ticket. 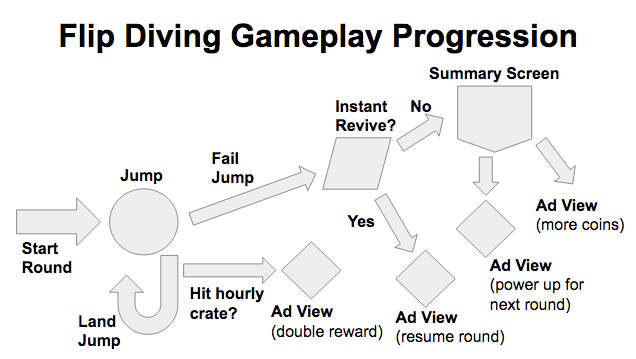 Likewise, the ostensible simplicity of Flip Diving’s gameplay belies a complex ad monetization progression built atop the diving round mechanic described earlier. The player’s goal in each round is to successfully land as many jumps into the dive area as possible in as good of form as possible; the player collects coins midair during jumps, and then is awarded coins at the end of each round based on the number of successful jumps landed as well as the score awarded to each jump. 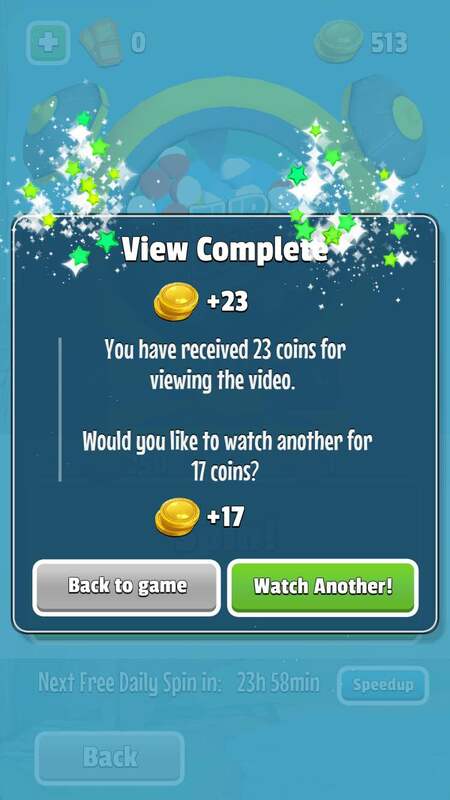 Watch a video for more coins. 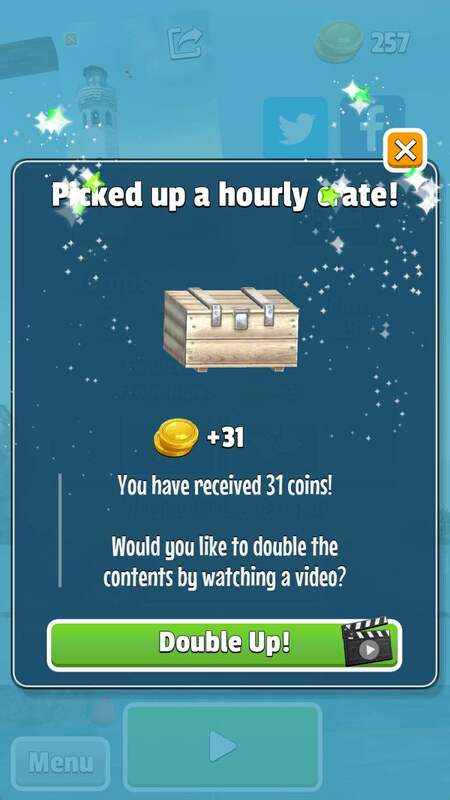 And in addition to this, an “hourly crate” is made available each hour that the player can land on in a jump: the crate is a separate gacha mechanic that confers some random reward upon the player — and, as with the spin machine, if the hourly crate produces a coin reward, the player can watch a video to increase the size of the coin purse. 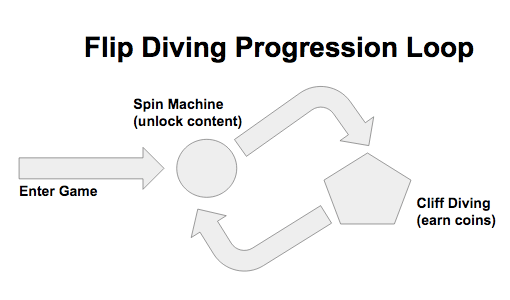 If these progression schematics appear busy and hectic, it’s probably because Flip Diving was seemingly designed to be played in very short sessions many times per day. Given that rewarded video ads run for 30 seconds, players must be presented with many opportunities to watch rewarded ads for the game to achieve 1-2 average video views per session. For such a casual game, this is a shrewd design choice: when a publisher (that is, an app that is selling ad inventory) is mediating its ad impressions through a third-party platform, the first impression in a session is worth more (in terms of CPM bids) than subsequent impressions. And so a publisher makes more money, assuming the same number of total ad views, from many short sessions than few long sessions. Showing a first-impression ads earns more than a second-or-more-impression ad, and so casual games that monetize primarily through video ads are served well with many sessions per day per user. 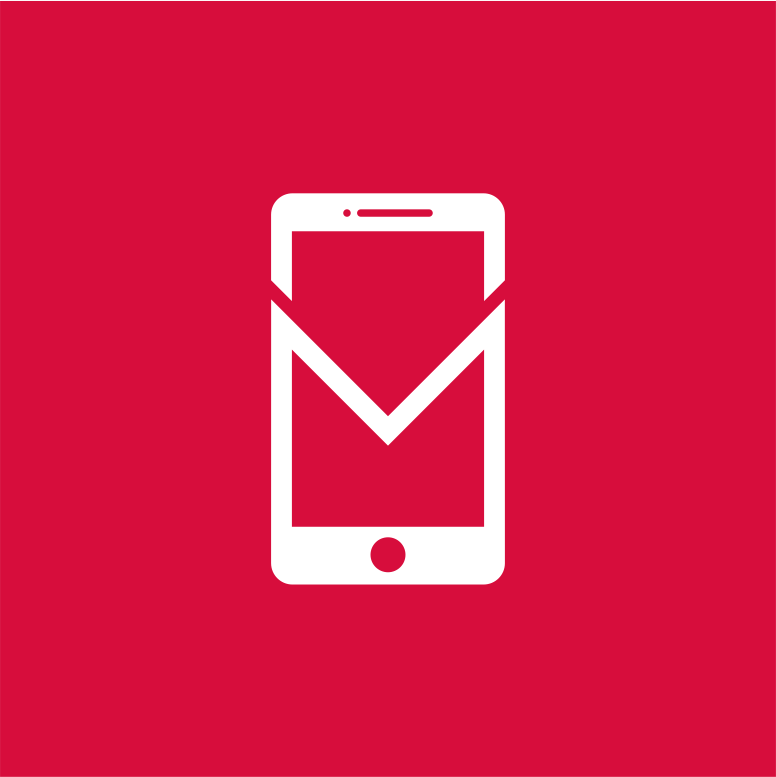 But squeezing ad impressions into short sessions requires some user interface sorcery: the limited screen real estate of the mobile form factor restricts the number of options for watching ads that can be presented to a user at a given time. Flip Diving sidesteps this (for the most part) by eschewing the simultaneous presentation of multiple ad options and instead chains ad views together, back-to-back, into single options (eg. 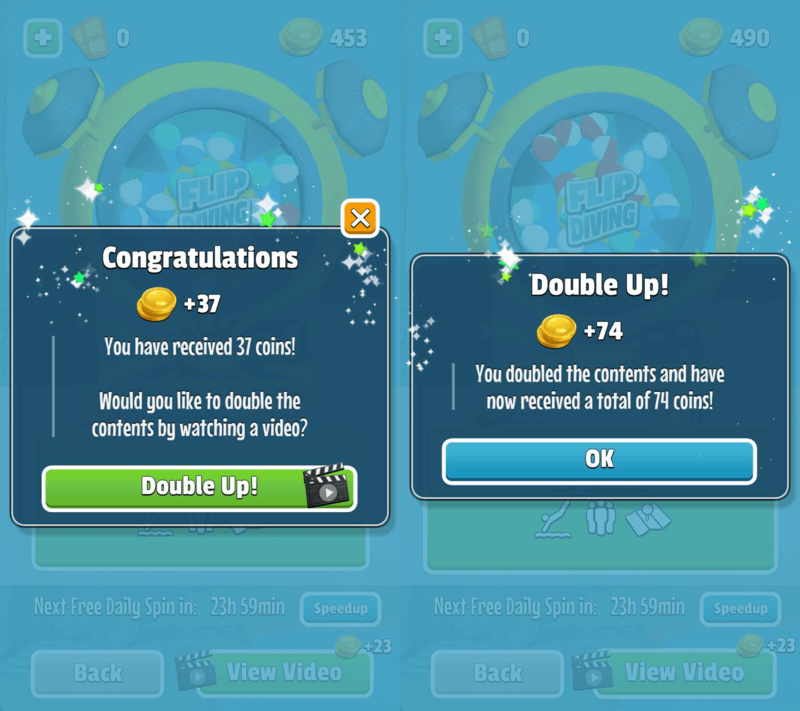 doubling rewards for the spin machine). This is handled in a practical and fairly composed manner in Flip Diving: the player isn’t made to feel like an advertising receptacle despite the impressive number of potential ad views that are packed into any given session. (See more Mobile Dev Memo case studies here).